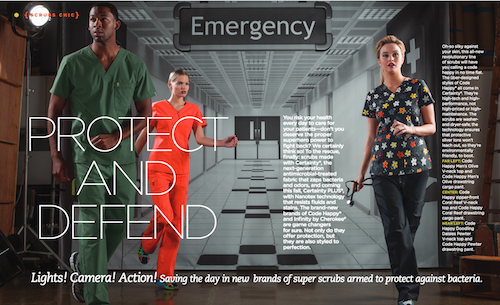 Protect and defend in gear that’s fit for a hero—treat yourself to a stylish set of scrubs made with CERTAINTY, the next-generation antimicrobial-treated fabric that helps defend against bacteria and odors. And, come fall, you can add CERTAINTY PLUS, with Nanotex technology that resists fluids and stains, to the mix. 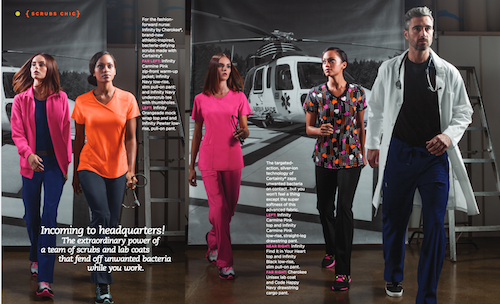 In the Spring 2015 issue of Scrubs, we turn the lens toward two new CERTAINTY-made brands—Code Happy and Infinity by Cherokee. Check out the beautifully (and intelligently) designed workwear that made the cut for our fashion shoot below. Infinity by Cherokee Carmine Pink sporty zip-front warm-up jacket with CERTAINTY (style #2391A); Infinity Navy low-rise, slim pull-on pant with CERTAINTY (style #1124A); and Infinity Navy long-sleeve underscrub tee with thumbholes to keep hands warm, with CERTAINTY (style #2626A). Shoes, K-Swiss Tubes Run. Infinity Orangeade mock wrap top with slimming front and back princess seams and knit back panel for extra comfort, with CERTAINTY (style #2624A); and Infinity Carmine Pink low-rise, straight-leg drawstring pant with CERTAINTY (style #1123A). Shoes, K-Swiss Tubes Run. Infinity “Find It In Your Heart” (FIHT) mock wrap top with slimming front and back princess seams and knit back panel for extra comfort, with CERTAINTY (style #2628A); and Infinity Black low-rise, slim pull-on pant with CERTAINTY (style #1124A). Shoes, Asics Craze TR. 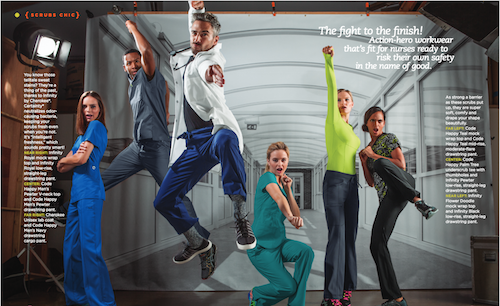 Cherokee® Unisex lab coat with CERTAINTY (style #1346A); and Code Happy Navy drawstring cargo pant with CERTAINTY (style #16001A). Shoes, K-Swiss Men’s Classic LT.
and Code Happy Men’s Olive drawstring cargo pant with Certainty (style #16001A). Shoes, Asics Men’s Kayano. Code Happy Coral Reef zipper- front V-neck top with slimming front princess seams with Certainty (style #46600A); and Code Happy Coral Reef low-rise, straight-leg drawstring cargo pant with Certainty (style #46000A). Shoes, Asics Noosa. Code Happy “Doodling Daisies” (DDAE) V-neck top with CERTAINTY (style #46613A); and Code Happy Pewter mid-rise, moderate-flare drawstring pant with CERTAINTY (style #46002A). Shoes, K-Swiss Tubes 100. Infinity by Cherokee Royal mock wrap top with slimming front and back princess seams and knit back panel for extra comfort, with CERTAINTY (style #2625A); and Infinity Royal low-rise, straight-leg drawstring pant with CERTAINTY (style #1123A). Shoes, K-Swiss Tubes 100. Code Happy Men’s Pewter V-neck top with Certainty (style #16600A); and Code Happy Men’s Pewter drawstring cargo pant with Certainty (style #16001A). Shoes, Asics Men’s Kayano. Cherokee Unisex lab coat with CERTAINTY (style #1346A); and Code Happy Men’s Navy draw- string cargo pant with CERTAINTY (style #16001A). Shoes, K-Swiss Men’s Classic LT.
Code Happy Teal mock wrap top with slimming double princess seams and belted waist, with Certainty (style #46601A); and Code Happy Teal mid-rise, moderate-flare drawstring pant with Certainty (style #46002A). Shoes, Asics Noosa. Code Happy Palm Tree underscrub tee with thumbholes to keep hands warm, with Certainty (style #46608A); and Infinity Pewter low-rise, straight-leg drawstring pant with Certainty (style #1123A). Shoes, Asics Craze TR. Infinity “Flower Doodle” (FLWD) mock wrap top with slimming princess seams, with CERTAINTY (style #2628A); and Infinity Black low-rise, straight-leg drawstring pant with CERTAINTY (style #1123A). Shoes, K-Swiss Tubes 100. Have a favorite outfit? Share it with us in the comments section below!